Do you need assistance backing up, but are worried about a visually unappealing camera being placed on your car? 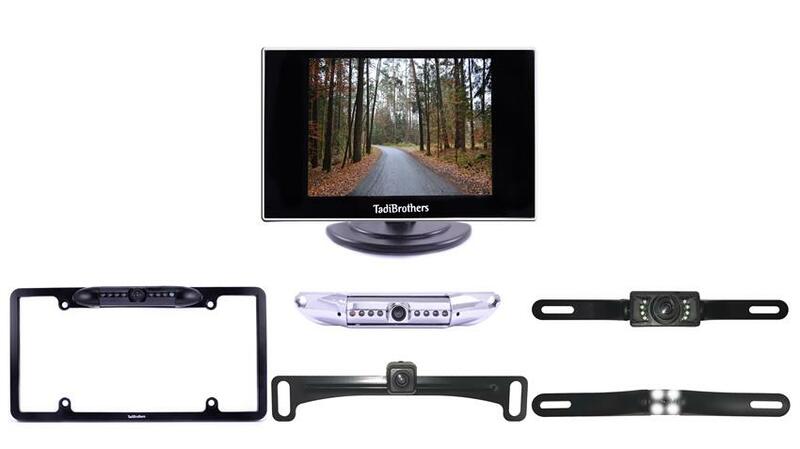 With the 3.5" Monitor with License Plate Backup Camera from Tadi Brothers, you will get the assistance you need without a bulky, noticeable camera stuck to your car. The 3.5" Monitor with License Plate Backup Camera system’s images are all displayed in rich color on a thin, lightweight monitor that is easy to install and operate. Power the monitor with any power source including your cigarette lighter, and even use the two video inputs for a gaming console or DVD player! You will be amazed at the stunningly clear images that are delivered to you by this system. No longer worry about what is in your driving path, and clearly see just how close to that tree you really are when you begin opening up your eyes to the world behind you. The visually appealing license plate camera is a sleek way to gain coverage of your surroundings. The camera is easily installed by simply screwing your current license plate’s screws into the camera’s brackets. Its easily adjustable features allow you to set the camera at an angle that is convenient for you. Cars, vans, and trucks will all benefit from this license plate camera from Tadi Brothers. A wide viewable angle, military grade night vision, and the ability to stand up to harsh weather conditions make this camera an ideal choice. Shop Tadi Brothers today for all your backup camera needs! the lower limit for operating the camera is 0 deg. C or 32 deg F. in our area winter temperatures will exceed this lower limit. does this make the camera ineffective? Yes it will work in all conditons. We sell these to the hottest and coldest regions of the US and Canada. "I would like to thank you for the fast service you provided on getting my camera. A lot of companies could learn a lot from your excellent customer service. Thank you again for the prompt service. " "Was very impressed by this camera, I had bought a new hyundai which didn't come with a back up camera like my previous volvo had had, after doing extensive research I found tadi brothers and they helped me find what I needed. It was very simple to installs the instructions were very straight forward, I ran into one issue with the install which tech support assisted me with and all it happened to be was a loose wire."